The Usonian house is laid out on a poured concrete slab. Two essential elements of the slab are its color, Cherokee Red, and the three-foot grid pattern of the surface scoring. The slab is surrounded by a series of concrete sections set about two inches from the edge. But the house is really all about the blocks and their installation. Wright envisioned unskilled labor mixing and pouring concrete into wooden molds and then laying and stacking the blocks, without mortar, onto the grid in two wythes (walls) throughout the structure. The walls are twins, and provide the finished version of both the interior and exterior. The space between provides insulation. The blocks are “knitted” together in a system of steel rods and grout set into the “tubes” or “tunnels” that are created by the half-pipe shapes on all four edges of the blocks. Hence the term: textile blocks. The vertical rods are set into holes drilled into the slab. 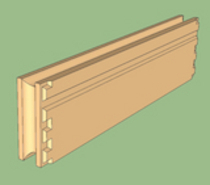 The horizontal rods are set into the center of the tunnels by virtue of a specially designed support bracket that spans the wythes and provides a platform for the rods. Click the image (or here) to see more images and detail. The blocks are set onto the slab, and then onto each other, until the wall is complete. At the halfway point, course five of nine in most cases, masons pump in grout through the vertical “tubes”. Gravity and pressure ensure that the grout spreads through the “tunnels” as well. The combination of grout and steel rods “knits” the blocks together. There are 47 unique block designs and about 2,000 total blocks in the house. Click on any image for an animated close-up .